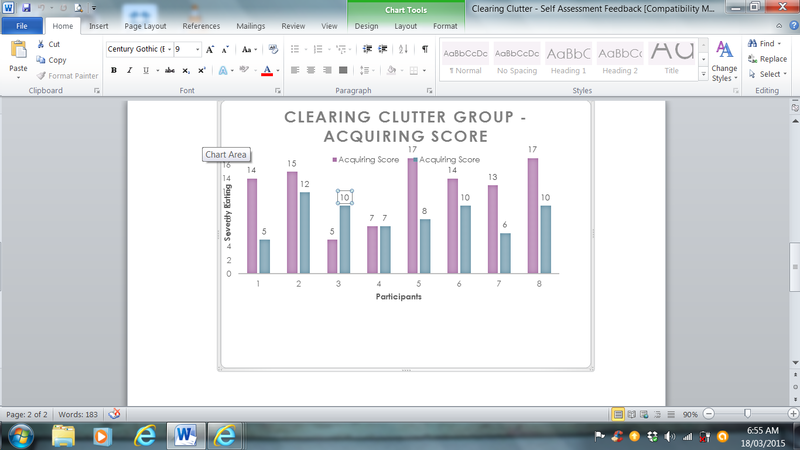 The participants were asked to complete a self-assessment at the beginning of the Clearing Clutter Support Group and then again at the end. 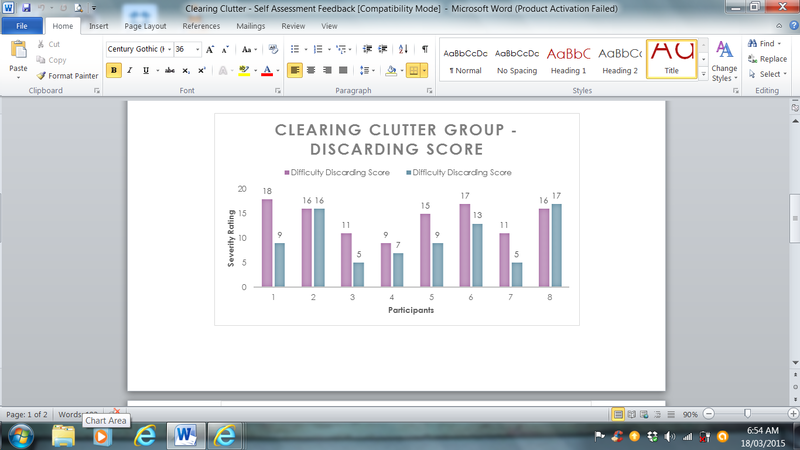 These assessments asked participants to rate themselves in 3 general categories: Clutter, Difficulty Discarding and Acquiring. 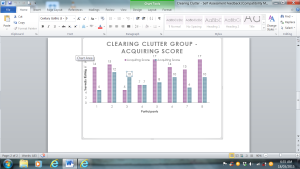 The bar graphs below indicate the progress made by individual participants in each area. 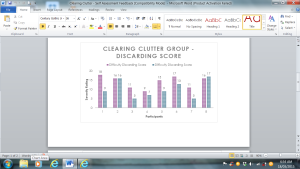 A higher score indicates more severe or extreme challenges related to clutter, discarding and acquiring respectively, whereas a lower score indicates mild to moderate challenges in these areas. The next graph shows the improvement that has happened around being able to discard items. It is really all about the lessened anxiety about being able to let go. The final one here and the one that people are most able to get a handle on easily is the awareness and ability to stop acquiring so much stuff. As you can see, everyone was able to make progress. WOW!! 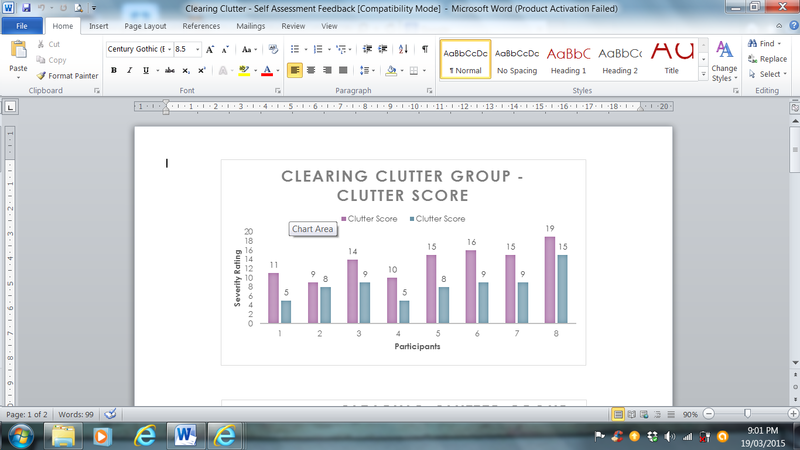 Participants made some huge improvements and you can too!! Thank you for following me along on this journey. 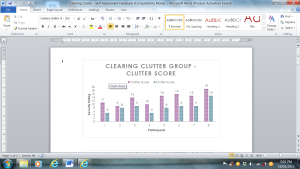 This entry was posted in De-Clutter Your Life, goal setting, Inspiration, Organizing and tagged chronic disorganization, clutter, Clutter Support Groups, hoarding. Bookmark the permalink. Thanks Seana, It is amazing the progress that everyone makes. They are usually so surprised too. Thanks for commenting!! That is wonderful! It must be fantastic to see everyone’s reactions. Will you follow up with them again to see if they hold their gains?